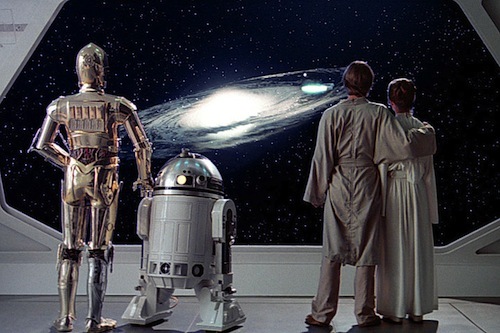 Generation Star Wars: Original Star Wars trilogy theatrical cuts on Blu-ray? Original Star Wars trilogy theatrical cuts on Blu-ray? Disney's about to release brand new steelbook editions of the entire Star Wars saga on Blu-ray disc, ahead of The Force Awakens theatrical release this December, and there's a rumour the Mouse House may bring the original theatrical cuts to the silver platters in the future, too! That's according to director John Landis (An American Werewolf in London) during a Q&A promoting the American Werewolf maze that's opening at Universal Studios in Orlando. The rights to the distribution of the original trilogy do not revert to Disney until 2020 and Twentieth Century Fox retains the rights to A New Hope in perpetuity. Presumably some kind of deal would have to be struck before the movies could be shown theatrically or made available to the home market. There's a commercial impetus in view of Disney's sizeable investment in Lucasfilm and its most successful franchise. Would you like to see the original trilogy sans special editions? Let me know in the comments below.